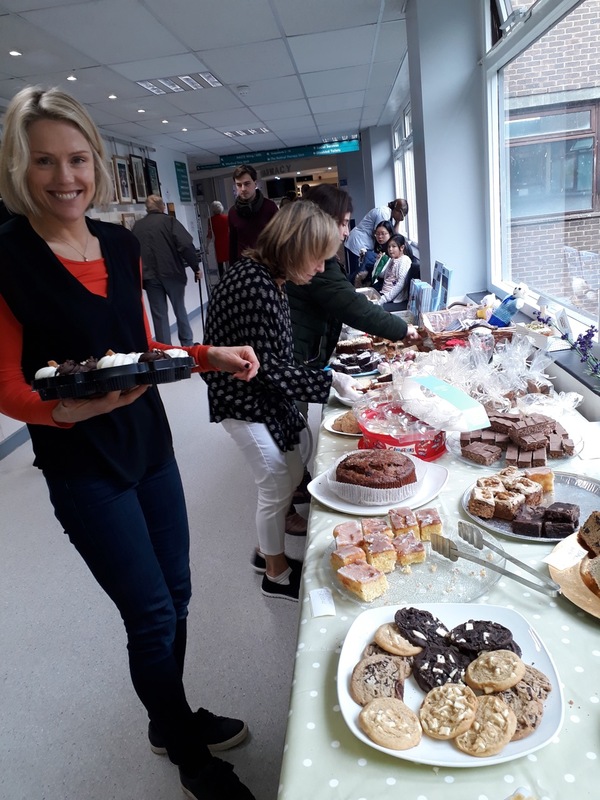 GRACE held a cake sale at The Royal Surrey on 21 March for Ovarian Cancer Awareness. We raised a total of £636 to fund equipment and research. We also handed out lots of our awareness leaflets and received lots of new subscribers to our quarterly newsletter. If you’d like to sign up, please click here. A big thank you to everyone who baked for us, especially the ever-giving Lucy Dodds and all her baking friends. Thanks to Gabriel Salah, Caroline Hobbs, Amanda Borlase, Claire Hill, Mandy Woods, Stephanie Horner, Kavitha Madhuri, Sue Clarke, Simon-Butler-Manuel, Friends of Nicola Pegler, Rugaia Montaser and anyone I may have forgotten. We had an amazing spread of yummy and irresistible home bakes. Thank you also to everyone who came and bought cakes and so made it a success. Our youngest visitors were three week old triplets — even more delicious than the cakes! We didn’t have a single crumb left. We look forward to seeing you in June to raise awareness of cervical cancer screening. We hope very much to be bringing back the very popular Big Samosas on that occasion — unfortunately our Samosa Supply Angel was on holiday in Goa so couldn’t help us this time. Please get in touch if you would like to bake for us or help on the day.